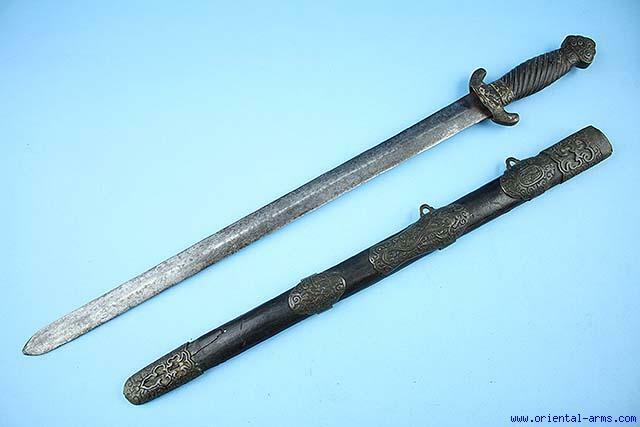 This is a short Chinese straight sword Jian . Early exemplar. first half of the 19C. or earlier. Massive straight blade of flat diamond cross section, probably laminated, 20 inches long. Black horn nicely ribbed grip. Black lacquered wood scabbards with finely chased brass mounts. Total length 26 inches. Very good condition. Nice age patina on the blade and all mounts. Lightly cracked scabbard.